Datalogic has announced the release of 2 new kits for the Gryphon GPS4400 2D presentation area imager. The GPS4400 imager offers the same capabilities and performance as the Gryphon GD4400 handheld scanner, but in a presentation-style form. The lone difference versus the product models currently available, the 2 devices provided in the kit feature a USB interface only (GPS4421) vs. USB and RS-232 cable provided with the GPS4490 kit. The new kits include the imager plus enhanced USB ‘type A’ cables matching the product color which are also guaranteed for enhanced immunity from environmental disturbances. 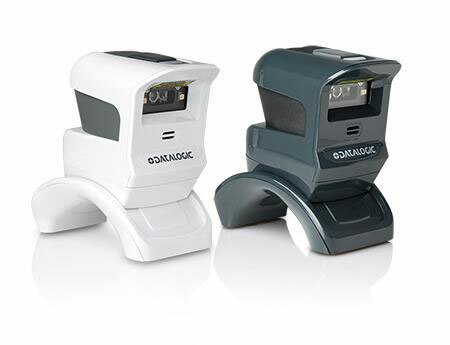 For assistance finding the right Datalogic scanner for your needs, contact us at Barcodes, Inc. The Gryphon GPS4400 scanner is a new presentation scanner in a stylish body available in shiny white or dark grey. The GPS4400 scanner offers all the capabilities and performances of the Gryphon GD4400 handheld scanner, but in a presentation-style shape. The scanner can be used by itself or in combination with its sliding semi-circular stand. By itself, this scanner allows minimum volume occupancy and can be appropriate when reading small items or it can be positioned over a shelf or console in an elevated position. When the scanner is placed in the stand, it is elevated in height making it easier to read larger items and allows the scanner to be oriented in a more natural position depending on the application and the needs of the user. The stand also includes 2 holes which allow the stand to be attached to a wall or bench in a vertical position by using 2 screws. The screws holes are mechanically compatible with the Magellan 1100i stand, simplifying the replacement of an existing 1100i scanner with the new Gryphon GPS4400 scanner.